The Office for National Statistics has today published the latest divorce rate figures, for 2005. These show (amongst other things) an 8% drop in the number of divorces in England and Wales and a steep drop in divorce rates for men and women under 40. The average age at divorce has risen over the last 10 years, and the number of people going through a second divorce has nearly doubled since 1981. Perhaps of more interest to divorce lawyers are the facts that 69% of divorces in 2005 were granted to wives, of which 53% were on the basis of unreasonable behaviour; the most common fact proven for divorces granted to husbands being two years’ separation with consent, although that was only 32%. I'm sure all of the above says something profound about our society today, but I'll leave it to others to draw conclusions. Suffice to say that if current trends continue I think there'll still be enough work around for us divorce lawyers for a while yet! Typical. A couple of days after I said that there haven't been many family law related news items recently, the entire (albeit tabloid) front page of The Independent today is filled with one. The story comes from an interview with senior Court of Appeal judge Lord Justice Wall who warns that 'the cheap and quick divorce laws in England and Wales are undermining the institution of marriage and need to be reformed to help prevent acrimonious break-ups'. He goes on to call 'for an end to fault-based divorces and the introduction of a system that puts the needs of children and financial provision at the heart of the process', stating: "I do believe strongly in the institution of marriage as the best way to bring up children and that's one of the reasons why I would like to end the quick and easy divorces". Of course, the Family Law Act 1996 was intended to bring in a no-fault divorce system, but it was abandoned when it was thought that it's provisions would be unworkable. Lord Justice Wall does not accept this and says: "I still think the Family Law Act would have helped make couples think seriously about the care of their children and proper financial provision". But he is resigned to there now being no early changes to the system and states: "now it looks like we will have to wait another generation for reform of the divorce laws". I do not necessarily agree that the present system is undermining 'the institution of marriage' (I feel that social factors are the primary cause for there being more divorces - see, for example, my previous post here, and the article to which it refers), but, like (I believe) most family lawyers I do advocate a no-fault divorce system. Fault-based divorce creates unnecessary animosity which can make financial settlements and, more importantly, arrangements for children more difficult. I'm also not sure that I'm with Lord Justice Wall on the merits of the ill-fated Family Law Act (I recall attending one seminar on the Act in which neither the eminent speaker nor the audience of solicitors and barristers understood how the new system was supposed to work), but I agree that it unfortunately looks unlikely that a new, workable, system will be devised and introduced within the foreseeable future. I never realised before I became a blogger just how quiet the summer months could be for family law news. 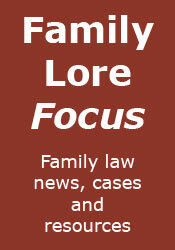 As any regular reader of this blog will know, most of my posts are based upon some family law related news item. However, recently there have been very few such items, hence fewer posts. There have been some odd items, but it has never been my intention to try to cover everything - only usually items upon which I have some comment to make. Following on from my recent post regarding the McCartney divorce, I've just seen a press release that Families Need Fathers put out a few days earlier, about the appointment of their lawyers. In it the organisation expresses it's "dismay at the news that Sir Paul and Lady McCartney have appointed expensive lawyers to handle their separation" and states that "involving the legal profession in family matters usually results in a great deal of acrimony and financial burden". Sadly, I know from experience that this can be the case, but in these days of the Family Law Protocol and Resolution's Code of Practice I would have hoped that most family lawyers would have a rather more enlightened approach, which can actually assist and encourage amicable settlement of disputes. Unfortunately, it appears, the message isn't getting across, although whether this is because too few family lawyers actually practise this approach, or simply because the public's perception of family lawyers hasn't changed (fuelled by lurid press reports such as in the McCartney case), I don't know. Nothing to do with English family law, but I couldn't resist mentioning this wonderful story about a Filipino judge on BBC News today. Judge Florentino Floro had been sacked after he said that he consulted imaginary mystic dwarves. Sounds quite reasonable to me, but the Philippines Supreme Court did not agree and refused his appeal, saying that "dalliance with dwarves would gradually erode the public's acceptance of the judiciary as the guardian of the law, if not make it an object of ridicule". Shame. In the Comment column in this week's Gazette Angela Moores, a partner and head of family law at north-west firm Ricksons gives her views upon the government's plans to axe the Child Support Agency. She is sceptical about the proposals, particularly the methods of enforcement that will be given to the new agency, which she thinks are no more likely to succeed than the old system. However, what amused me was her final comment, in relation to the recommendation by Sir David Henshaw's report that all parents should be allowed to make their own private child support arrangements where possible. She says that it is her "experience, and that of many other family lawyers, that to date the greatest incentive for parents to make their own arrangements was the threat that if they did not, they would each have to deal with the CSA". Yes, that's certainly been my experience! I've said before that I'm not particularly interested in celebrity divorces, but the apparent increasing animosity in the McCartneys' divorce brings to mind a recurring problem: how (and whether) to maintain a conciliatory approach when your client wants you to be more aggressive. Did Sir Paul McCartney's solicitors really write a complaining letter after Heather McCartney removed three bottles of cleaning fluid from his home? If so, how did they reconcile this with (inter alia) paragraph 1.3.3 of the Family Law Protocol: "It is crucial that solicitors or parties do not raise irrelevant issues nor unreasonably cause other parties or their own clients to adopt an entrenched, polarised or hostile position"? From time to time my own clients complain that my correspondence is not as aggressive as the correspondence we receive from the other side, despite the fact that I advise my clients of the approach I intend to adopt at the outset of every matter. I don't mind such complaints, as they generally indicate that I have been successful in keeping the correct tone in my letters, but they do leave a quandary: do I dig my heels in and insist on keeping a conciliatory approach (thereby risking losing a client), or do I agree to 'take the gloves off' and engage in an aggressive exchange of correspondence? The answer, of course, will vary from case to case. Sometimes it is clear that more aggression is (unfortunately) required, although we must never allow ourselves to fall into the trap of being a mere 'mouthpiece' for our clients, who simply want to use our headed notepaper to say whatever they want. In a Press Release today the Association of Lawyers for Children has expressed grave concerns over the impact of Lord Carter’s review of legal aid on the ability of vulnerable children to obtain the specialist legal representation they require. They state "that since 2001 the number of family law legal aid contracts has fallen from 4,593 to 2,784" and that a payment scheme that reduces these numbers still further is "an entirely false economy, is bad for children, bad for society and bad for the country as a whole". As many may know, Resolution is campaigning for cohabiting couples to be given a 'safety-net' of basic property rights should they separate. Meanwhile, they have published some useful advice for cohabitees to protect themselves if their relationship breaks down, including such things as making a will and formalising shares in jointly owned property. The full advice can be found in the media section of their website, here.